"Mr. Bartel! I've brought you someone." France isn't exactly known as a horror hotbed, but recent years have seen gems like Haute Tension shock audiences around the world. Taking a more cerebral (and preferred) approach to terror, these daring films leave us with much to discuss. The latest director to throw his hat into the French horror ring is Fabrice Du Welz, making his feature film debut with Calvaire (translated to English as The Ordeal). Du Welz hits the ground running with a story and style that preys on our fears of that there just might be no turning back from. Marc Stevens (Laurent Lucas) is a low-grade singer/performer finishing up a gig at a retirement home. After being hit on by one of the tenants, as well as a nurse, Marc heads to a Christmas Gala in his trusty van. His travels lead him down some shady roads, where he nearly hits an animal. When Marc stops to see what ran out in front of his van, he is spooked by Boris (Jean-Luc Couchard), and suddenly can't start the vehicle. Boris takes Marc to the backwoods home of Bartel (Jackie Berroyer), who promises to fix his van. After spending a few days with Bartel, Marc awakens one morning to find himself in the middle of a living nightmare. Calvaire starts off in a fairly low-key fashion, but things get more and more bizarre as time passes and we discover Bartel's true intentions and what he has in store for Marc. Then, we get the soon-to-be-infamous pub scene where the patrons begin dancing in the strangest of ways to some spontaneous, aggressive piano playing. While one of the final set pieces might seem a little too much like the finale of The Texas Chainsaw Massacre, Du Welz quickly redeems himself with an amazingly disturbing, effective shot where his camera encircles the proceedings, making us just as dizzy and delirious as Marc. Philippe Nahon (the "killer" in Haute Tension) gives yet another creepy performance in what initially appears to be a small role. While his character materializes into more than he initially seems, Laurent Lucas' Marc undergoes a transformation that is beyond disturbing. Marc is a character that we completely sympathize with, as he has no negative attributes that we're privy to, enhancing our involvement in his "ordeal." Still, Calvaire never crosses the line to becoming too depressing to be entertaining. It's a film that's definitely not for everyone, but its collection of engrossing performances and utter strangeness will have horror buffs clamoring for more, especially with Halloween rapidly approaching. This horror show will more than likely get a bad rap for raising questions and providing very few answers. Fortunately, the imagery and claustrophobic atmosphere that Du Welz creates negate any such frustration, and give us 90 minutes of pure terror. The stark realism of the situation should hit home with nearly everyone, and after enduring Calvaire, I, for one, will think twice before stopping my car for any unnecessary reason. Image Transfer Review: This gorgeous, anamorphic widescreen 2.35:1 presentation captures the director's dark, gritty vision perfectly. Blacks are appropriately deep, while contrast and shadow levels are well-handled. The colors are strong, with the reds being particularly impressive. The graininess seems to be a byproduct of the shooting style. Audio Transfer Review: The audio is available in both Dolby Digital 5.1 and 2.0, with the 5.1 providing a more involving experience. The surrounds are very active, especially in the more surreal, experimental sequences. They are boosted by aggressive bass, while the dialogue is always crisp and distinct. 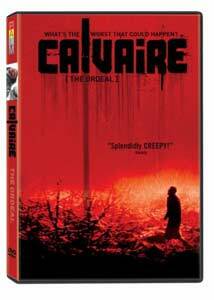 Extras Review: There are only a handful of extras, but the 27-minute Making of Calvaire provides some great insight into the production. We see some great on-set footage accompanied by an interview with director Fabrice Du Welz. There's also the US theatrical trailer and previews of other films from Palm Pictures. If you're ready for a nerve-wracking descent into hell, then strap yourself in and pop Calvaire into your DVD player. Palm Pictures brings this French import to the States in fine fashion, beginning with some of the creepiest cover art you'll ever see. Highly recommended.